Freshman student, Quanadra Tunstall, dominated her first year on the girls varsity basketball team. Quanadra made Second Team District for the season, but she was also made First All Region Team after an explosive tournament in the Regionals. Quanadra started to play basketball at the age of eight. Before she started playing, she was a cheerleader for six years until she wanted to try basketball. Quanadra set a mission for herself in basketball. 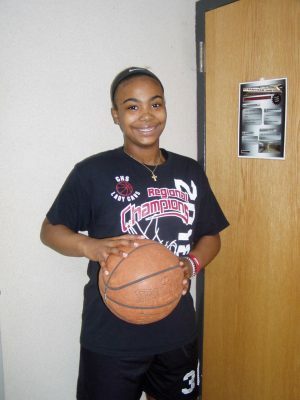 She hopes to hit 1,000 basketball career points, make Player of the Year, make First Team Regional and District, and get state rings before she graduates. She still wants to continue her basketball career by playing at one of her four top choices: Virginia Commonwealth University, James Madison University, Virginia Tech, and Louisville State University.